need some advice on airsoft gun found ?? 100% legal to own, the VCRA covers Sale, Manufacture and Import. It being able to shoot or not is irrelevant, it being a RIF is just down to how it looks. You could carve a realistic looking machine gun out of wood and it would be covered by the same rules as an airsoft gun, ridiculous but true! If you find something, the law requires you to take reasonable steps to return it to the owner otherwise you could be committing 'theft by finding'. If no one claims it after a reasonable period of time, you may then become its new owner. Given there is an airsoft shop nearby, I'd ask there first. As to owning it, you don't have to paint it, as said above, you didn't buy it so it doesn't need to be at least 50% a bright colour. Would be the same as being gifted it. 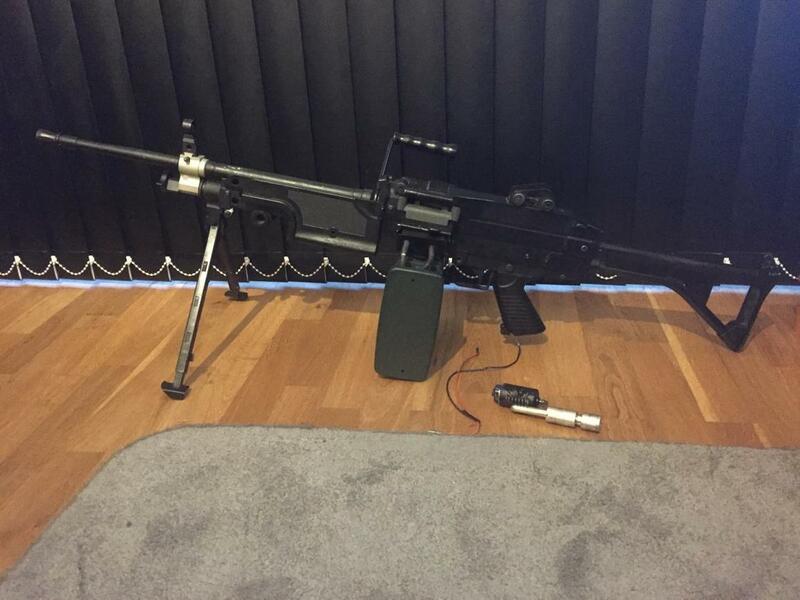 It looks like it's an A&K M249. If someone did bin it, it seems very irresponsible to have done so in such a visible manner, which makes me suspect it may well have not been the intention of its owner. Of course, that is speculation on my part, but something I think may be worth pointing out. - Edit - Just noticed the other parts in the pic, looks like an A&K M249. Might consider rephrasing this, even if he did buy it, he does not need to paint it on that basis. OP might just visit the police (don't take the gun) and ask if an airsoft gun has been reported stolen, and leave a phone number, not much more needed. "i dont mind if i have to paint it so it dont look like a real one but i have had a google and find the laws a little confusing"
I was responding to this bit specifically. I'd contact the police, certainly, but I meant it may well be easier to contact the shop first to see what they know (if anything).